After the quiz, we spent this shortened session by looking at declining and distressed companies, arguing that you need to adjust your expected value for the likelihood of truncation risk or failure. We then moved on to emerging market companies, and the challenges you face in valuing them. We will spend more time on the dark side in the next class. So first question look too easy right. Because I gave you the growth rate, I gave the divisions in year three, you just multiplied by 1.03 And you are off to the races. But there's one big catch. What is the catch. That the return in equity will not change overtime. Think of an equation. What's the equation for growth return on equity Dems retention ratios you to go to I give you two out of the three. The third has to be calculated. So the first three years what did they give you. I gave the girl straight to indirectly because you saw the income growing and I gave you the. Retention rate or the payout ratio which is. If you have the growth rate and the retention rates show what can be for far away once you get the IRA we get BAEO for what they say happens. Your growth drops but their return equity says they want equation. I've given you the two of the three variables or do you have to solve for. Any of four. You have to solve for a new retention ratio. Which means you can't take your 3 dividends and grow them one year because your going is significantly undervalued company and here's why. What are you making them do that you're making them act like a mature company and paid dividends like a growth company. That company is not going to be worth much. That was really the heart of mine because you just take dividends one point or three it's a one minute problem right. You get the value. But what you're doing is you're violating the stable return and equity. The second problem is just a question of Do you remember what to add and what to subtract. So what you do at. The minority holding in another company which is subtract the portion off the majority holding that doesn't belong to you. So if you say look I've got not just a sign off and plus on one and minus that said that's a whole day I guess. Now if I'd given you this is just what it. Would have instead of giving you the Consolidated Companies numbers in the first try I'd given you the parent company numbers in the front. First I almost thought about doing it. See how many of you would be worth if I give you the parent company numbers what would you have to do. You'd have had to add both. But this time he divided the 10 percent of company B and the 60 percent of whatever the third company is. So watch out for those things the cross holdings are a mess you forget what to add to subtract the loss from what was the key. I told you the market's price this company right. Right. Which means that they've taken a took on the options and they've come up with the value of equity. I gave you the value of the options. Through really the only question is add that number subtract that number because so should add subtracting. Added years right to get to the value of the equity in the common stock. 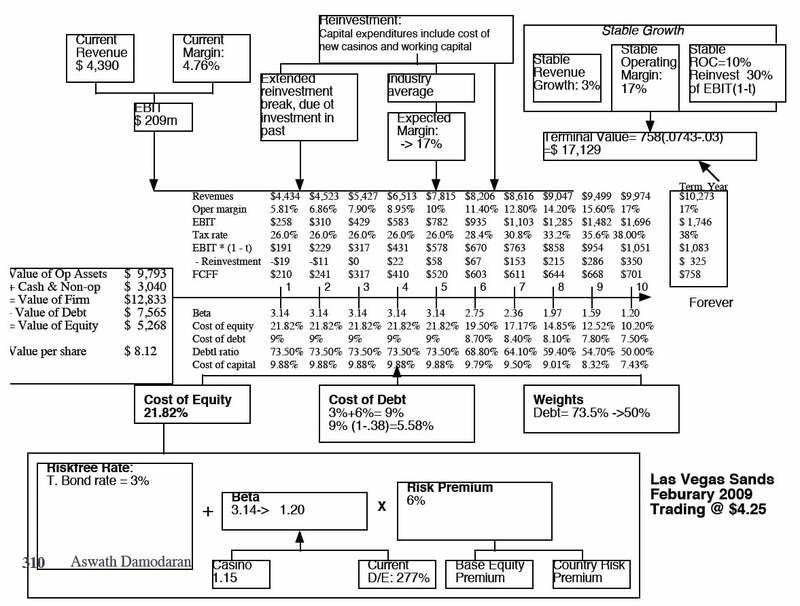 Just going back what you're reversing the is right because it when you value traditionally started the top when you walk down the value of equities subtract the option to get a value the common stock cure I've given you the stock price and the number of shares you actually have to work backwards which means you should be adding the value of the options and the rest is just pure algebra. Because the cash flows is given a couple of blocks where the reinvestment rate was what's really tied to her and gave you the cash flow directly. Don't go looking a gift horse in the mouth of Goodwillie net income in which case you had to return equity and all the rest of the crap. But I assume that the first prompt to do that already. What's the point of testing you again. So it's it is done. We're on to the last faces of intrinsic value. So I'd like to talk a little bit about that third phase of the life cycle we've talked about young growth companies. And on your. Eyes. I was looking at your. Devaluations Latifiya pick young growth companies and. Companies like sales force and you know Yelp. Yelp was a big one. Tablo is another one. Nardy young growth company valuations. And I know what you hope from me but all I did was I affirm your numbers and said Okay this is your story and this is the evaluation Tallaght and that's all I could do. All I could point out was inconsistency if you told me a story that was inconsistent with the numbers that you were telling me then I said you told me this companies under margin pressure why your margins going up so to the extent the feedback if you're expecting something very specific. I was going I couldn't give it to you because it's your story your valuation and all I can do is let you take ownership of it. But a few of you were valuing declining companies that must be avoided them why because they're depressing. And if you think about what makes declining companies are difficult to value let's assets for questions. When I ask you what do you cash flows from existing assets and you look at your history what do you see in it declining company revenues are flat or declining and margins are falling through the floor. When I ask you what's the value of growth do you start laughing what's the value of growth.